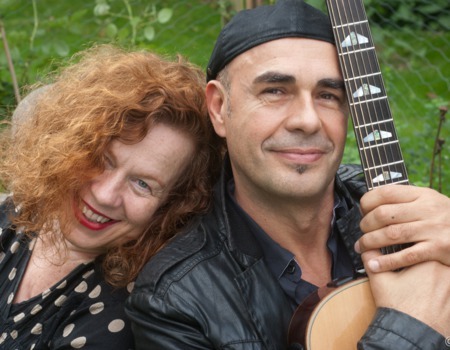 Summer 2016 will see Sarah Jane Morris and Antonio Forcione come together in a worldwide tour to promote the launch of their collaborative album 'Compared to What'. This duo have each been compared to an impressive array of musical geniuses including Janice Joplin and Tom Waits (vocally) as well as Jimi Hendrix (instrumentally) - a comparison Antonio wears with pride. Django Reinhardt also comes to mind. In truth, Sarah Jane and Antonio are great artists in their own right. Channelling their energies together, they share audiences in Italy, Britain, and all over the world. Together they increase their spheres of appreciation, giving loyal fans the chance to experience favourites afresh, as well as attracting new audiences with the strength and artistry of their unique partnership. 'Compared to What' is the result of a fruitful and varied song-writing collaboration. It covers a number of traumatic social issues and many songs of emotional intensity which reflect the urgent concern both artists feel for the tragedy of refugees. One song in particular deals with the boat people - a drama most keenly felt in Italy and by Italians - with Sarah Jane and Antonio acting as tribunes of conscience. This sense of witness describes many of Sarah Jane's most passionately felt songs from the recent past, and in new material Antonio adds his own awareness and artistic response. Alongside the songs of conscience, 'Compared to What' includes some wry comedy, also love songs and some memorable covers, notably Stevie Wonder and Bob Dylan. Sarah Jane's and Antonio's set touches heights of great musical beauty both in Antonio's unique virtuoso guitar playing and Sarah Jane's legendary voice, now more subtle and persuasive than ever, with range and power undiminished. The whole is a triumph of collaboration between two of the most individual and richly talented musicians on the world stage.